North Carolina fans in a frenzy as they head to the bench during the second half. Photo by Jason Schott. 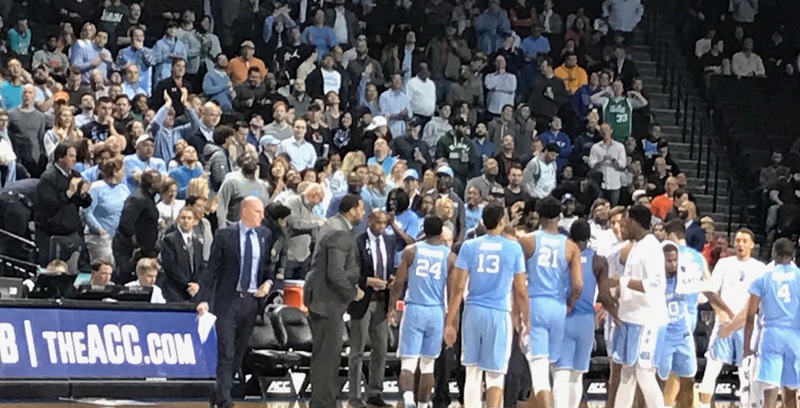 The North Carolina Tar Heels erased a 14-0 deficit by halftime on their way to an 82-65 victory over the Miami Hurricanes in the ACC Tournament Quarterfinals on Thursday night at Barclays Center. The win set up a meeting with archrival Duke in the semifinals for the second straight season. Tip-off will be Friday night at 9:30 pm. One of the turning points of the game early was when North Carolina was down 12-0 at the 13:34 mark of the first half. UNC Head Coach, Roy Williams, took out is five starters - Kenny Williams, Theo Pinson, Cameron Johnson, Luke Maye, and Joel Berry II - and brought in Sterling Manley, Garrison Brooks, Andrew Platek, Seventh Woods, and Brandon Robinson. Williams said of the wholesale substitution, "You know, substituting five for five, I've done it several times. One year my high school coach told me, I could never do that. But generally what was I supposed to do, take out Theo, leave the other four in, or take out Joel? I was mad at everybody. I was less mad at Theo because I don't think you had taken a shot during that stretch. But the other guys, they practice every day, and they really enjoy it when they beat the white team, and they talk trash to them and stuff like that, but it is competition every day. "I can sit over there and say, well, they'll work their way out of it, but I like to see if I can jar them a little bit more and slap them in the face a little bit more with the action, not personally but -- sometimes it's worked, sometimes it hasn't, but I do have a great deal of confidence that the game is not going to be lost in the first seven or eight minutes of the game." Williams added, "Down 14-0, wasn't real pleased with those guys. After that, those five guys that came in off the bench, Seventh, Andrew, B. Rob, Garrison and Sterling, really did a great job...those five guys got in, and the best play was Seventh taking the ball to the basket because the first group in there acted like we were going to be shot and killed and done all kinds of things. We missed shots and we were tight and missing everything, missing lay-ups." After it got to 14-0 Miami, Williams' move paid off, as Seventh Woods got a three-point play, and Sterling Manley dunked one to get it to 14-5. Soon after, at the 9:07 mark, Joel Berry II made a layup to cut the Miami lead to 16-12. North Carolina eventually tied it at 23 on a Theo Pinson layup with 4:15 left in the first half. It looked like Miami was going to go into the half with a 31-29 lead, but Lonnie Walker IV made the ill-advised decision to foul Cameron Johnson on a heave from beyond the halfcourt line. Johnson went to the line and drained three free throws to give North Carolina the improbable 32-31 lead at halftime. Miami Head Coach Jim Larranaga said of the foul by Walker, "I really thought that was a very typical situation in terms of us not being as sharp mentally as we needed to be. We just didn't make smart decisions. We had a nice lead. We were playing well, and all of a sudden we started rushing. We got caught up. We had a couple of fast breaks where we hit under the rim because the defense was swiping at the ball and we were not in control. Yeah, it was important. It was definitely a shift in the momentum." The second half was back and forth to start, and was tied at 50 on a three from Miami's Ja'Quan Newton at the 10:42 mark. From there, North Carolina eventually began to take over, as a Pinson layup made it 66-58 UNC with 6:15 remaining. Miami responded with a 5-0 run, as Walker got a layup followed by a Newton three-pointer to make it 66-63 North Carolina. Pinson responded with a three, then Anthony Lawrence IV drained a pair of free throws at the 3:50 mark to make it 69-65 North Carolina. Incredibly, those were the last points Miami scored, as North Carolina closed the game on a 13-0 run, including five from Pinson and four from Kenny Williams on a pair of layups. Pinson led the way for North Carolina with 25 points on 9-12 from the field and a perfect 2-2 from behind the arc, with 11 rebounds to give him a double-double. He also notched three assists and three steals. After the game, Pinson said he is "just taking what the defense gives me. I have the ball in my hands a lot, so I have the choice of shooting the ball or passing to my teammates. Of course I would like to get my teammates -- I love getting my teammates going. I have joy in doing that. But at the same time, if they're not going to play me, I've got to be aggressive. That gets my teammates going. If I'm scoring, I'm a threat, so that means they have to guard me, too, and that just gets those guys even more open shots." Williams said of Pinson, "You know, the first three he took tonight I was really happy he took it. The second one -- was that when the shot clock was winding down? I'll answer this for him. He's had some walk-around games on the defensive end of the floor. And I think he's gotten more focused defensively in the last 10 games, and I think that's made him more active offensively, too. "But we've tried to put the ball in his hands more consciously. I think it's been good for him, and I like 9 for 12, but I think 2 for 2, also. But I did really like the first one. The second one, somebody has got to take a shot because the clock is winding down. Not just scoring, guys -- 11 rebounds. He doesn't look like Arnold Schwarzenegger up here, but 11 rebounds, and I think the way he plays has just been sensational. I am moving him this week from honorable mention to high honorable mention." Pinson said of North Carolina's mindset down 14-0 seven minutes into the game, " I think at that point, we've been here before, even with the same team. We was in the same situation last week. We knew that we was going to make a run. There were shots that they could make, but I think we were rushing them. We were a little antsy about the game, and they just didn't fall for us. "I'm just really proud of the guys that came off the bench, like Coach mentioned. I told them in the locker room even after the game when they interviewed me, I told them, those five really won the game for us. I mean, they settled us down. They got us playing to the way we needed to play. 7 set the tone by getting to the basket, and that was a huge play for us to see that we just shot all threes. We need to get to the cup and see what could happen." Williams said of the game, starting with his wholesale substitution early, "Weird game to say the least...I just wanted to shake them a little bit and put those five guys in, they got it to 14-5 and sort of calmed the came down a little bit. "At the time-out I told them, and I really meant it, let's give these five guys a chance and if they don't turn around and start playing better then I'll put you back in and let them sit the rest of the half, and I really meant that. I thought that was huge for us getting us back in the game, and then all of a sudden, it may have been like 16-16, something close to that. I very seldom look at the score but I did a couple of times in the first half today. "After that point, I thought Theo (Pinson) was sensational, 25 points, 11 rebounds, really controlled the whole tempo of the game on the offensive end. I've said many times he's a play maker and in some ways maybe as good a play maker as anybody I've ever coached in 30 years as a head coach. Everybody wants to talk about the dunk, but I like the way he sort of read the defense. There's a lot of guys on the street corner that can dunk, but read the defense and see what they gave him there was sensational. "I'm really surprised. I thought he had three assists. Maybe one of his most important ones was to Joel Berry in the corner right in front of our bench. Didn't you give him that one? And sort of just perked the whole team up for Joel to make a shot. "We rebounded the ball better in the second half. They beat us second-chance points in Chapel Hill, they beat us in points off turnovers in Chapel Hill. We didn't guard them at all. They dominated the game in Chapel Hill even though it was won on a last second shot they dominated the game. "For us it was a little more revenge, and I even used the word redeem. Never used it last year until we got to Phoenix. I hadn't even heard it, but I said let's redeem ourselves by how we play defense tonight. "I'd like to say weird game. Ja'Quan (Newton) just kept playing. I think he likes to play against the Carolina Blues. He played awfully well tonight (17 points, 7 rebounds, an assist), and Lawrence made those two threes in a row that were really big. Really happy for our team. Luke made 13 rebounds. So he did something even though he was 1 for 15. I believe in being straightforward with people. I told him if he had gotten one more rebound, he could say he rebounded all his misses. But 1 for 15 and "still win and do some things, I think that's fantastic." In addition to Pinson's big effort, Cameron Johnson had 13 points, seven rebounds, and five assists. Kenny Williams and Joel Berry II had 11 points apiece, with Williams adding five rebounds and an assist and Berry getting two rebounds and two assists. Luke Maye was held to two points, but he made up for it with 13 rebounds. Berry and Maye combined to shoot 5-for-29 on the night, and Williams said of winning despite a tough night from two of his best players, "Well, we've always felt like we're not just one guy, not just two guys. We lost Marcus Paige and Brice Johnson a couple years ago. It's impossible to be more important to the team than they were but we win the National Championship the next year because Theo and Joel, those guys, Justin we tried to make sure they felt important their junior year when we lost in Houston. "But I think the way we've always tried to coach is have kids who will buy into being part of a family, buy into being part of a team, and know that when one guy is down, somebody has got to pick them up, and I think we've had that happen. And I will agree with you, that may have been about as heavy a lifting as we've ever done, 4 for 29. But again, you just think about those guys that came off the bench. You think about Theo, you think about Cam. 13.7 rebounds, five assists, zero turnovers. We had Theo diving on the floor for a loose ball that got us a possession. We had Kenny getting on the floor for a loose ball and a missed free throw that got us another possession. "So those two guys have gotten most of the accolades, but it is a team out there, and I'm happy about that."